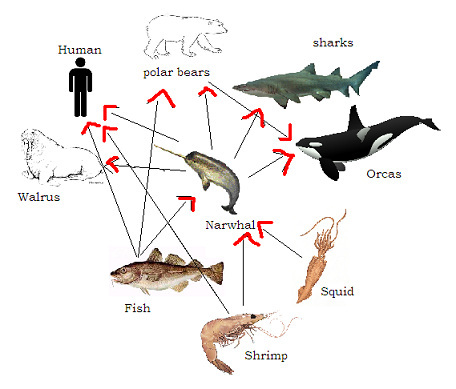 The narwhal is at the bottom of the food chain- not a good position. It has lots of predators including humans. The orca, a black and white whale eats the narwhal! The shark also eats the narwhal. Another danger! The polar bear is a very strong animal that also lives in the arctic. Watch out narwhal! The walrus is very protective of its land. It eats fish and narwhals! Yes, the human kills and eats narwhals, what a disaster! We don’t want the narwhal extinct! Don’t worry fish don’t eat the narwhal. The narwhal eats the fish! Shrimp are little creatures that narwhals eat! Squid are little critters that are preyed upon by the narwhal! So to conclude the narwhal eats fish, shrimp and squid and is preyed upon by orcas, sharks, polar bears, walruses and humans. So let’s stop killing the narwhal and start saving it!